Can't decide whether or not to budget for a landscaping company to keep your lawn looking great? Here are five great reasons why you should. Decades ago it was considered lazy and wasteful to have someone take care of your lawn; not so in today's busy world. Here are 5 reasons you should hire a landscaping company. You know, just in case you need a little more prodding. Let's face it. Curb appeal matters whether you are selling your home or not. The better your property looks the more valuable it is going to be. Not only are you going to enjoy it more but when and if you do decide to sell your home you are likely to get a higher offer if the landscaping looks good. The magazines make it look easy but creating a cohesive landscape can take experience. Certain plants grow better in shady areas while others do better in full sun. 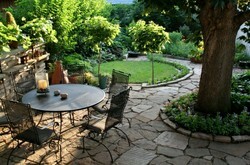 There are a myriad of facts to know in order to have a beautiful garden area. A professional landscaper will not only know these facts but will know specific information about your area. That sounds silly, doesn't it? Yet it is so true. Professional landscapers have the experience, education, and creativity to make your yard looks its best. They know what plants grow well in the area you are living in and can quickly solve sick plant problems. They can look at your property and let you know about potential problems and how to fix them; saving you time and money over the long run. You work hard all week and, unless you really love mowing the lawn and weeding the garden, the weekend should be free to do what you like. Heading off to the lake on a 90F day is even more self-indulgent when you are waving goodbye to the guys who are making your garden look amazing. Not only do you not need to use up your valuable free time, you can stop worrying about how you are going to pay for a new lawn mower as well. Consider the savings in gasoline and the cost of equipment, maintenance, and repair. A good landscaping company can make your garden dream a reality while working within your budget. By working with you over a period of time your vision for your property can happen in stages. You may want that flagstone patio in first, and then the rose gardens, and then the fountains but eventually it can all come together, beautifully finished. A landscape design company can advise you on what to do first so that when everything is done it is balanced and beautiful. Finally, a good lawn maintenance service can spot problems before they actually happen and take steps to keep them from happening. Whether you have a tree that is weak and about to tumble down on your brand new car or your rose bush is dying because it needs iron the service can let you know and help you decide what steps to take to vanquish the problem before it takes hold. While it may be tempting to hire the cheap guys that put the flyer on your car windshield it is important to get references and shop around. Talk to a variety of landscapers, nurseries, and businesses in your area and ask lots of questions. Drive around your neighborhood and talk to the neighbors with the nicest lawns. Get references and ask for addresses so you can drive by and see the work up close and personal. The lawn service you choose should be a company that you feel comfortable with, one that has people that you feel connected with, and one that you feel gives you a strong working relationship. Choosing to use a lawncare maintenance service can give you an enviable yard while freeing up time for you to do more of the things you really enjoy. Are You Considering Using a Lawn Maintenance Service? Yard work is something I enjoy, but one day I will not be able to do it all. Pamela, I look out over my yard and just wish.... despite my teenage sons! I know...right there with ya...and envy the 19 acres. I wish we could afford it, but with 19 acres I'm a do it yourselfer:-) Good thing I enjoy working in the yard! Why Do People Paint Their Tree Trunks White? I often see trees with the bottom of their trunks painted white and decided to find out why.